The Dorchester Educators Education Support Professional of the Year award recognizes the contribution of Education Support Professionals to their schools, communities, and profession. The award is presented to the member of Dorchester Educators who demonstrates outstanding accomplishments and reflects the contributions of ESP to public education. This award is presented by Dorchester Educators. Every kindergarten class needs a bit of magic and at Sandy Hill Elementary School Victoria Harris provides just that. As a Sandy Hill Kindergarten Instructional Assistant, Ms. Harris is known for her “magical hugs”. They calm first-day-of-kindergarten fears, soothe ouchies, appease hurt feelings, pacify the I-miss-my-mommy moments, and cool angry feelings. But that is not all. Ms. Harris assists with small group instruction, helps with transitions, keeps students on task if the teacher has to redirect her attention for a moment, fills-in for teachers if needed, and leads intervention lessons. And after the paid part of her day is over, Ms. Harris is still going strong, helping with the school’s Running Club and the Young Ladies Club which she started to help girls learn basic courtesies and manners, offer opportunities for community involvement activities, and introduce them to crafting and various opportunities they may not have at home. Now in her 11th year with DCPS, Ms. Harris says it is her hope that “the things I do and say plant seeds that will someday have a positive impact in someone’s life”. And when you do your job with such love and tinged with magic as Ms. Harris does, how can it not? 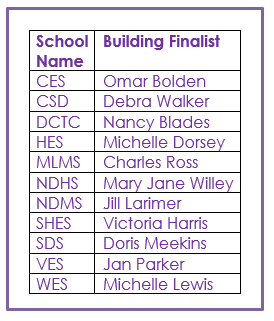 Read more about each of the finalists here. ​Mr. Lovett is a 9-year employee of Dorchester County Public Schools, and a member of Dorchester Educators for 8 years. When he began his career as an Educational Specialist for DCPS he noticed a need for positive role models among the young men of North Dorchester High School. He started the Gentlemen’s Club in 2010 as an organization that taught young men to respect one another, professionals in their community, and themselves. The program also focuses on manners, self-respect, and loyalty to their education, community, culture, and their families. Mr. Lovett stands as a role model for these young men, teaching them that they can live their lives fully, change their destiny, and achieve their dreams. We are honored to have Mr. Lovett represent Dorchester Educators and Dorchester County ESP!